Description: A single lite engine rolls past Alburtis on its way to the C&F Secondary. Description: The NS H65 setting out cars for the NS H02 in Washington yard. 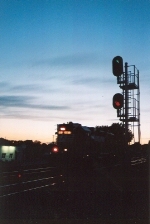 Title: NS H76 Push/Pull With BDRV SW1200 1202 @ 1227 hrs. 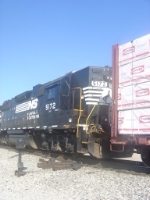 Description: These Geeps are in the process of switching a cut of intermodal cars. Description: H2W heads northbound with a decent sized train. Description: H2W has clear track ahead as they blow for the crossing at MP 213. 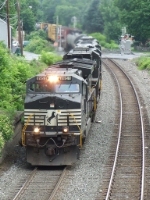 Description: H2W with three locomotives and four cars heads through Southside. Title: NS 3381 H76 "Push-Pull"
Description: At the interchange with the Black River & Western, 1743 hours. Description: Heading southbound as light power H3W blasts through a small snow bank at MP 219. Description: H3W heads southbound with a rather long train of about thirty cars. Description: A look at NS 5172.